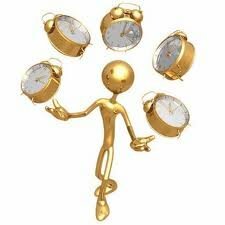 How to manage time? Or how to manage myself to get more things done? How to manage time! That's a statement I hear a lot from wahms (work-at-home-mums) like me. Always juggling a whole lot of tasks trying to keep all the plates spinning. Sometimes it's a treat if we fit in a five minute shower. Our things always seem to come at the bottom of every to-do list. Thus, when on top of this, we choose to start our own business from home, it's imperative that from the outset, you free up quality time on a daily basis. feeling frustrated that you can't find the time and/or energy to work on your new venture. Whilst operating a business from home offers an array of advantages (no commuting, no 9 to 5 rigid schedules, no boss, more time to spend with kids), it also carries with it a number of challenges. One major issue is how to manage time. Some people find that making to-do lists and crossing off completed tasks work. That's fine as long as the list does not only include the day or the week's chores. In order to make things happen - and be more productive long term, we have to look at the big picture from 3 important aspects of our life - namely - our mind, our body and our emotions. All three should go hand in hand but very often they clash. It's of little or no use that you liberate the time just to find yourself staring blankly in front of your computer screen, thinking about all sorts of other unrelated stuff. Therefore, apart from time, you also need to let go all the clutter in your mind and make yourself physically strong so as to make the most out of the limited time available. Start off by identifying and getting rid of the major culprits that are wasting the bulk of your time and energy. Incomplete tasks - things we start and leave half done. Multitasking - doing a lot of different things at the same time, all the time. Disorganization - when stuff is not in place, messy environment. Let's look into each one and do a simple yet effective exercise on every one of them. These will help you eliminate some of the nuisances that hinder you from managing your time better. Don't do the exercises simultaneously. Go one at a time. Give yourself enough time to adjust to one regime before going to the next exercise. You will feel some resistance at first. That's ok. We're talking about getting out of your comfort zone. Your mind will tell you one thing whilst your emotions will tell you another. Self discipline plays a huge role here. Do not worry, though. This will only happen until you get used to the new practices. Eventually they will become part of your daily routine.